Time for more "Things I am Loving This Week", mostly foodie related things I am enjoying right now and want to share. First up, I made the Raspberry Scones from the BabyCakes cookbook by Erin McKenna last week and really liked them but this week, I am loving the Banana Chocolate Chip Bread. Moist, rich and decadent, it doesn't taste like a gluten-free, vegan snack bread. With further exploration of the book, it seems not every recipe is truly gluten-free and many use spelt flour, which although wheat-sensitive people may find it a good alternative, those with allergies to gluten shouldn't use it. In fact, the publisher has now changed the sub-title on the book to reflect that it is actually: "Vegan, (Mostly) Gluten-Free, (Mostly) Sugar-Free Recipes". The banana bread is GF however and uses Bob's Red Mill Gluten-Free All-Purpose Baking Flour. It makes one big loaf of bread, but what is better than a big loaf of fresh banana bread? Mini-loaves! It made 6 mini loaves which seem to freeze well and they make a nice snack or breakfast treat. Preheat oven to 325 degrees F. Lightly grease a 7 x 4 x 3-inch loaf pan with oil. In a medium bowl, whisk together the flour, baking powder, baking soda, xanthan gum, salt, and cinnamon. Add 1/2 cup oil and the agave nectar, rice milk, and vanilla to the dry ingredients. Stir until the batter is smooth. Using a plastic spatula, gently fold in the bananas until they are evenly distributed throughout the batter. Pour the batter into the prepared pan. Bake the banana bread on the center rack for 35 minutes, rotating the pan 180 degrees after 20 minutes. The finished loaf will bounce back slightly when pressed, and a toothpick inserted in the center will come out clean. Let the banana bread stand in the pan for 20 minutes. Gently run a knife around the edge of the cake, cover the top of the pan with a cutting board, and invert the loaf onto the board. Carefully left the pan away and re-invert the bread onto another cutting board. Either cut and serve warm, or wait until completely cool before storing. Cover the uncut banana bread with plastic wrap and store at room temperature for up to 3 days. Notes/Results: Loving it! A great banana bread that would please GF eaters and gluten eaters alike. 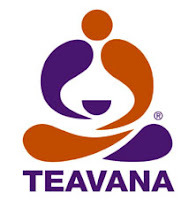 I have about a bazillion different teas and a favorite lately is the Thai Tea Blend by Teavana. 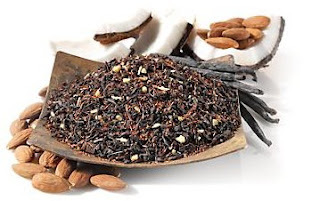 Described as "A delightful Thai restaurant blend of black and red teas, Hawaiian coconut pieces, almonds, and authentic Madagascar vanilla beans." With the weather on the warmer side, I am loving it iced, either with a bit of rice or almond milk or just plain. It's a great blend with a light coconut and vanilla flavor, tropical without being too tropical. We have no Teavana here in Hawaii but I order it online or my Mom sends it to me. Refreshing and good! I'd being lying if I told you I didn't love having my TFF dish last week, Chicken Paillard with Fresh Fig Salad and Blue Cheese, picked to feature on Tyler Florence's blog this week. It is cool to have my pictures and write up on his site. (See it here). It was such a great dish and for once I was pretty happy with how my pictures turned out. Maybe even more exciting is having another blogger try one of the recipes I posted and really like it. 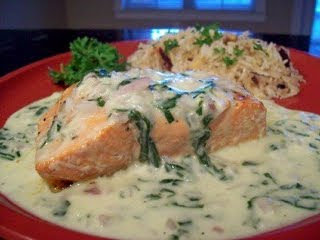 Heatherfeather from Lavender Blue, made the Coconut Spinach Cream Sauce, I adapted and "healthified" from Hawaiian chef Sam Choy and served it over salmon. Her version looks amazing and I am happy she enjoyed it. Heatherfeather is an American, who was living in London and recently moved back to the US. She has a variety of wonderful recipes on her site, so take a minute to stop by and visit her. That's what I am loving this week! What are you enjoying? what great things! I am loving the tea you gave me from teavana :) thank you!! You are having an excellent week! I have lots of teas too, but the baggie kind - I don't have a lot of experience with the loose stuff, although I do have a glass teapot with the plunger/strainer. I am all for mini loaves, they turn out so nicely. Yours look delish! Banana chocolate chip is my son's absolute favourite. It all looks good - love the look of the banana bread! I was just saying the other day how banana bread and/or muffins are the best way to use up bananas that are turning brown. And at that point, they're sweeter anyway, lending to the yumminess of the bread! What a nice selection ! I think the tea must be really special ! I am loving that you made banana bread! Especially since in comes in mini-loaf sizes. They are so cute! That tea sounds really good...I like coconut flavor in my tea a lot. Congrats on Tyler's website! You totally deserve it, that meal looked delicious. Banana chocolate chip bread - be still my heart - the best combination ever. Whenever I want a very special treat, I visit my local tea emporium for the Calvin Klein roubois tea - so good. The bread looks fantastic! I didn't know they made a gluten-free flour for baking. 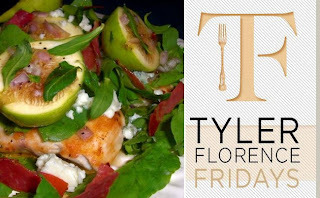 Kudos on having your dish featured on Tyler's site this week. Love banana bread and chocolate chips, yum! Everything looks great! Your mini-loaves are awesome :) Congrats again on being featured on Tyler's site (so cool!) and I am loving your "loving this week" posts! Yummy dishes and tea! Congrats on being featured on Tyler's site! mmm, that banana bread looks fabulous! Congratulations on the Tyler pick of the week - you must have been walking on air for a day or two after that! That banana bread looks absolutely gorgeous, I love the addition of the agave. I'm always looking for gluten free recipes to make for my best friend, and this banana bread looks delicious!